Vendors of products present you with more and more ridiculous agreements you supposedly have made with them by buying their product and opening the package. Whether you were aware of it or not, whether the agreement is reasonable or not, and whether it is legally enforcable or not. And agreement is in principle something that two or more people make consciously, after having negotiated the terms. 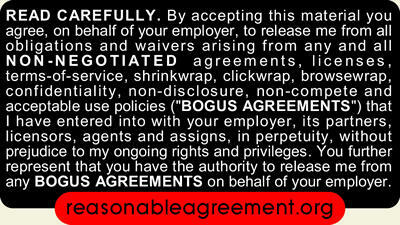 Something that benefits both parties, a contract they enter into knowingly. But a EULA or shrink-wrap license is entirely different, a one-sided attempt of making you the losing side, by implying that you've agreed to something you probably haven't even read. So, time to fight back. Bumperactive produces stickers like this one. The idea is that whenever you're communicating with one of those kinds of companies, you provide them with an equally silly contract they've entered into just by talking to you, or receiving a letter from you. So, you can put stickers like that on the back of the envelope when you pay your cable bill. Or you can read out the terms on the phone when you call a vendor. You can adjust the text to your own purpose, of course, and add any additional small print that tickles your fancy. Sounds very reasonable to me.